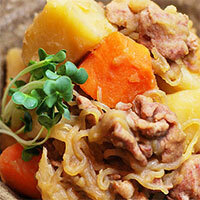 Nikujaga is a dish made mostly from meat, onions and potato. Originated from Japanese cuisine, this stew contains a variety of ingredients that make it taste uniquely. While preparing Nikujaga, meat (beef or pork), potato and onions are added to soy sauce and cooked with vegetables. Since potatoes make up most of the dish, they absorb most of the flavor and soup released from the meat and dashi. Vegetables used in preparing the meal are carrots, paprika onions, green beans, mushrooms and snow peas. One of the uncommon ingredients are shirataki noodles and dashi soup, used mostly in Japan. This meal is very popular in Japanese taverns and pubs. And even though it can give you a real energy boost, its calorie level is still at normal level, and that makes it a great dish for your everyday diet. The calories in Nikujaga per 133g(1 plate) is 170 calories. Nikujaga is calculated to be 128Cal per 100 grams making 80Cal equivalent to 62.5g with 19.35g of mostly carbohydrates、7.33g of fat、5.28g of protein in 133g while being rich in vitamins and minerals such as Molybdenum and Vitamin C.